Thanks to modern London live webcams, anyone can now make an exciting virtual journey to this city. Technical progress allows you to do this in real time, because webcams work online and allow you to see exactly what is happening in the British capital at the current time. London is truly a city of contrasts. This is an old city with a rich history and traditions, because London was founded in the middle of the first century AD. At the same time, this megalopolis can be called very modern, because the most modern technical and design solutions are used in architecture and urban planning. It is important that the development of London is very organic. Even with the help of online webcams, we can see that many modern skyscrapers have not spoiled the view of this metropolis at all. Quite the contrary: modern architecture harmonizes with classical buildings and domes of ancient cathedrals. 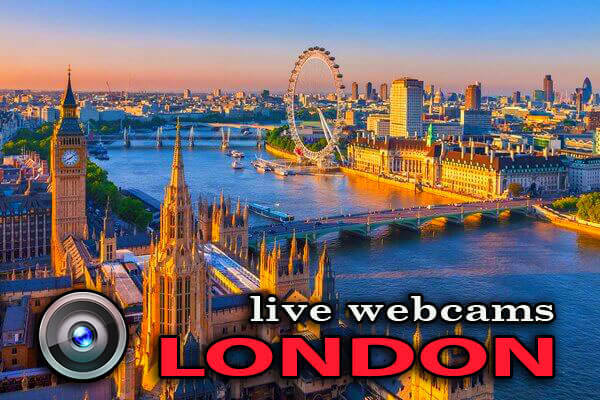 Since this site is not only entertaining, but also informational, under each webcam you will find brief, but useful information about the location of the webcam and objects that can be seen using this London camera. Also, according to tradition, a brief information is given on the features of the functioning of the webcam and the best time for viewing. 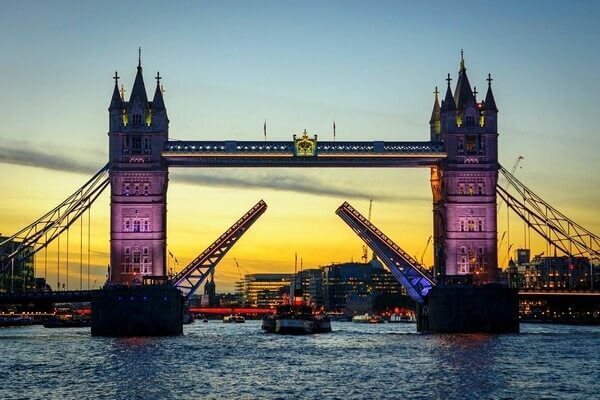 Even if you have never been to London, you have probably heard many times about such sights of the capital of Great Britain as Trafalgar Square, Tower Bridge, Buckingham Palace, Big Ben Clock Tower, the London Eye, etc. Most of these and other attractions can already be seen in real time using the London webcams that you find on this site. In addition, a number of online cameras of the British capital allows you to see several city attractions. And some cameras even have a turning mechanism and during the rotation allow you to see the whole urban areas. London is among the five largest cities in Europe, but at the same time in the British capital there are many green areas: parks and squares. First of all, it is the famous Kensington Gardens and Hyde Park. However, there are also lesser-known parks and squares that make the air in the city cleaner and serve as recreation areas for residents. A huge contribution to the maintenance of clean air in such a huge metropolis as London, makes the Green Belt of London. This is a special green zone around the entire city, covering more than 550 thousand hectares (this is about 10% of the territory of Greater London – the agglomeration of London itself and the surrounding counties. Part of the Green Belt of London can be seen using one of the panoramic webcams of the city. Many people believe in the myth that in London it is always overcast and it is raining, and the fog on urban scatters only by noon. 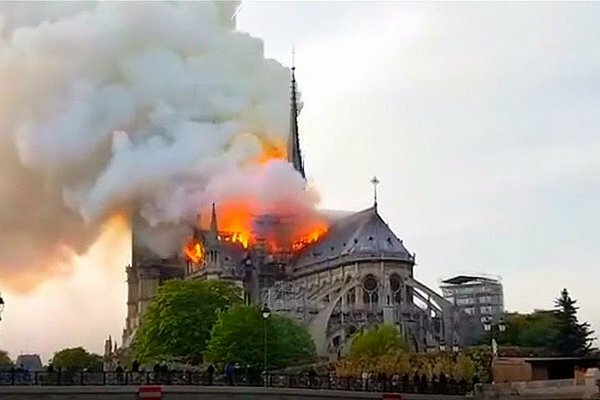 In reality, this is not at all the case, and London’s live webcams will allow you to see this. Of course, due to the mild climate and high humidity, rain in London is not uncommon. However, there are a lot of clear sunny days in the capital of Great Britain, especially during the summer months. But the stories about the fogs and thick clouds are more characteristic of a mild and warm London winter. It was at this time of year that films were shot here that create and support the myths about the “gray and foggy” city of Jack the Ripper. All of London live webcams, presented on the website are posted on separate pages for convenience and to save Internet traffic. In this case, London’s cameras can be divided into several groups. The first includes those webcams, which are organized by means of Youtube video hosting. These are full-fledged online cameras that can be launched using the familiar button in the center of the playback window. In this case, you have the opportunity to expand the video on the entire screen of your personal computer, laptop or mobile device. Also, using the standard YouTube settings, you can choose any quality of live video from London. Of course, it’s best to watch webcams in 720p and 1080p resolutions, i.e. in HD and Full HD quality. The second group of London webcams is made up of cameras that operate on the principle of a slide show. On the one hand, they are less interesting, because with the help of them it is impossible to see life in London at any given time. However, some of these webcams are located high above the ground level or allow you to admire the panorama of London from afar. In such places, in any case, it is impossible to see people, transport and architectural details on city streets. At the same time, information about the weather in certain areas of London, such webcams provide even the best – thanks to a wider coverage of the territory. In addition, these webcams in London have the opportunity to see not only the latest online photos, but also to see the capital of Britain for any five-minute interval over the past 24 hours. Those. we can see how a particular object or area in the city looks like in the morning, in the afternoon, in the evening, at night or at any particular moment. One of the most interesting webcams in London, which in real time allows you to see the many popular attractions of the capital of Great Britain. 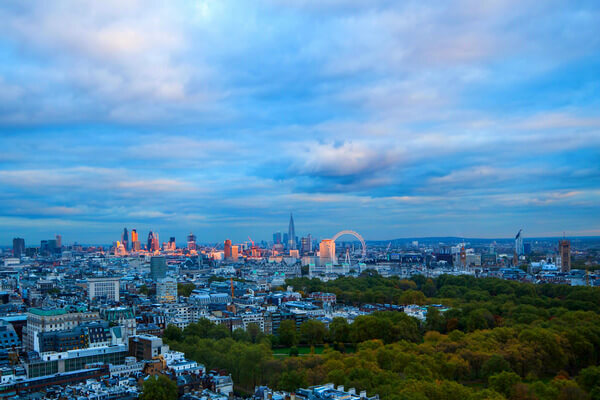 A feature of this webcam is its turning mechanism, thanks to which the webcam is constantly turning and we can see not only a specific area of ​​London, but a very large area of ​​the city. Of course, best of all we can see those buildings and facilities in London, which are located not very far from the location of this webcam. However, many sights of London are large, so even from a distance we can see their famous and easily recognizable silhouettes. To start viewing, click on the button in the center of the camera playback window! Despite the wide viewing angle, this webcam does not allow to see a 360-degree panorama of the city, i.e. the camera does not rotate in a circle, but from right to left and back from left to right. This London webcam in real time allows us to see several famous sights of the city at once. 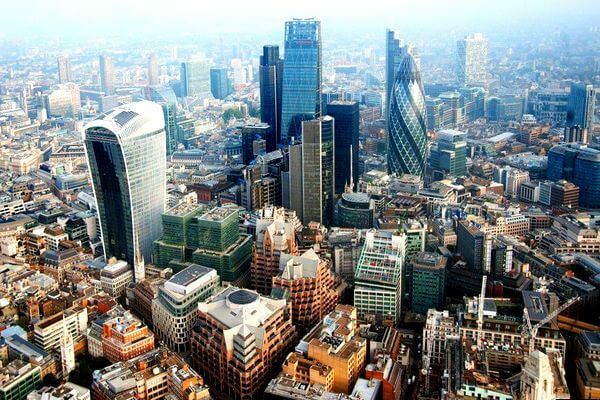 At first glance, it seems that the camera is located far from the center of London, because we can see on the horizon the business district of the capital of Great Britain and other objects that are located in the historical center. In reality, this webcam is also located close to the center and proves once again that London is a very big city. The location of this webcam is a five-star hotel London Hilton on Park Lane. The modern building of this hotel has 28 floors and more than 450 rooms of various classes. At the same time London webcam is located on the top floor. Due to this we can see the same interesting panorama of London as the guests of the most expensive rooms of this hotel in the British capital. In the foreground we can see a large park area. One of the most interesting webcams in London, which in real time allows us to see one of the monumental symbols of this city and the whole of Great Britain. The main object, to which the lens of this webcam is aimed, is the Tower Bridge across the wide river Thames. Two large towers, which are built on pylons in the central part, have a unique design that makes the Tower Bridge difficult to confuse with any other bridge in the world. The towers are built in Victorian Gothic style and have a height of 65 meters. Construction of the bridge was started in 1886 and completed in 8 years – at the end of June 1894. The length of the Tower Bridge is 244 meters, so its construction in the late 19th century required a number of innovative engineering solutions. The river Thames is navigable, therefore the Tower Bridge was originally built as a drawbridge. A new live webcam London, which allows you to see several main city attractions in real time. In the foreground of this webcam is the Westminster Bridge over the Thames. A little further (on the opposite bank of the river) we can see one of the most important buildings in the whole of the United Kingdom – the Palace of Westminster. To the right of it there is another attraction, which is a symbol of London and is depicted on most tourist postcards and souvenirs from England. Of course, this is a clock tower, which many foreigners call Big Ben, but in reality it has a completely different name. Currently, the tower is closed for large-scale reconstruction and is surrounded by scaffolding, so it’s not so easy to see it in detail with this online webcam in London. Westminster Bridge, connecting the two administrative regions of London – Lambo and Westminster – has six pillars and has seven arches – the largest number of arches among all London bridges. A new live webcam in London, which allows you to see in real time the large territory of this famous city. 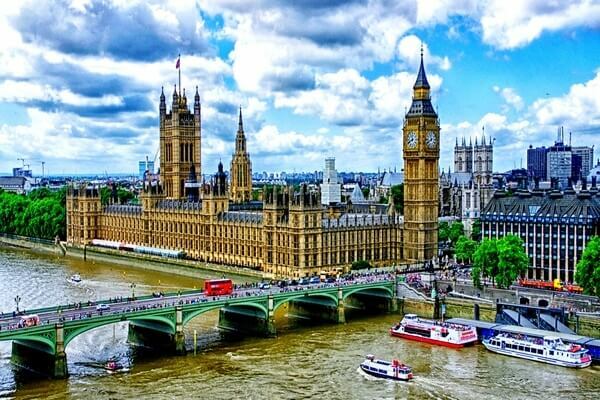 The capital of Great Britain is one of the largest cities in the world in terms of the area of ​​the city territory. At the same time, less than 9 million people live in the urban area of ​​London, but taking into account the suburbs, this figure is increased to 12.5 million. As you can see, the very location of this London webcam is a very high point above the horizon. Therefore, all the bridges on the Thames and buildings, even high cathedrals, look small. This visual effect is explained simply enough: this London webcam is located on the observation deck of the tallest building in London in the Shard London Tower. 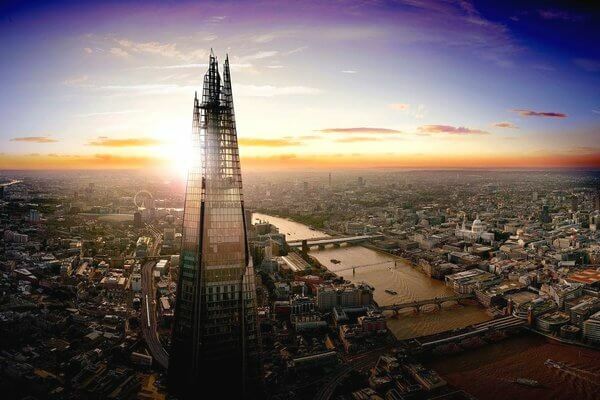 At the time of the completion of the construction (June 2012), the Shard London Tower was the tallest building in Europe, as the height of this 87-storey building of glass, metal and concrete reaches 310 meters. London live camera with a view of one of the new symbols of the city – the London Eye. This structure was built for six years on the south bank of the River Thames and was completed in 2004. Despite the fact that initially the Ferris wheel was considered a temporary structure, which after the completion of construction will function for about a year, the London Eye wheel repeated the fate of the Eiffel Tower in Paris and became one of the symbols of the city. And thanks to a height of 135 meters (the height of an average 45-storey building), the Ferris wheel is still one of the best viewing platforms in London. 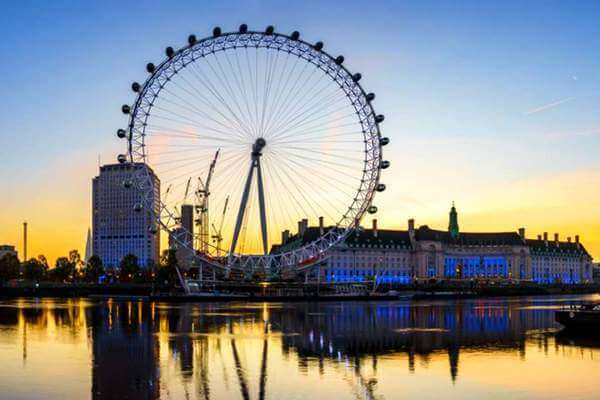 In clear weather, when there is no fog or smog in London, you can see the city and its surroundings for 40 kilometers from the capsules of the London Eye, which located at the top of the wheel. Using this webcam, which is located some distance from the Ferris wheel, it may seem that the capsules are small and designed for several people.